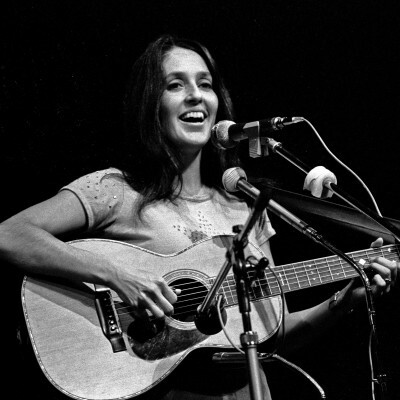 The year 2008 was a landmark year for Joan Baez, marking 50 years since she began her legendary residency at Boston’s famed Club 47. She remains a musical force of nature whose influence is incalculable—marching on the front line of the civil rights movement with Martin Luther King, inspiring Vaclav Havel in his fight for a Czech Republic, singing on the first Amnesty International tour and just this year, standing alongside Nelson Mandela when the world celebrated his 90th birthday in London’s Hyde Park. She brought the Free Speech Movement into the spotlight, took to the fields with Cesar Chavez, organized resistance to the war in Southeast Asia, then forty years later saluted the Dixie Chicks for their courage to protest war. Her earliest recordings fed a host of traditional ballads into the rock vernacular before she unselfconsciously introduced Bob Dylan to the world in 1963 and focused awareness on songwriters ranging from Woody Guthrie, Dylan, Phil Ochs, Richard Fariña, and Tim Hardin, to Kris Kristofferson and Mickey Newbury, Dar Williams, Richard Shindell, Steve Earle and many more. If ever a new collection of songs reflects the momentous times in which Joan finds herself these days, and in her own words, “speaks to the essence of who I am in the same way as the songs that have been the enduring backbone of my repertoire for the past 50 years,” Day After Tomorrow is that record, her first new studio album in five years (released September 9, 2008). Themes of hope and homecoming weave through Day After Tomorrow. Other songs explore the individual and collective anguish of life during wartime starting with the Tom Waits title track, “Day After Tomorrow” (introduced on his 2004 album Real Gone and reprised as the emotional closing track of Body Of War, the award-winning 2007 documentary of a paralyzed Iraq war recruit) and the haunting “Scarlet Tide” (written by Elvis Costello and T Bone Burnett for the 2003 Civil War film, Cold Mountain). Day After Tomorrow, recorded in Nashville, is Joan’s first full-length album collaboration with Steve Earle, who produces, plays guitar and sings harmony. Earle is represented on two new compositions: “I Am A Wanderer,” written overnight before one of the sessions and the album’s opening track, “God Is God” (which has already won a place in Joan’s concert sets, along with Earle’s perennial “Christmas In Washington” — “So come back Woody Guthrie/ Come back to us now…”). A third Earle tune closes the album in a cappella form, “Jericho Road,” a song that would not be out of place on a Staples Singers record (from Earle’s most recent album, Washington Square Serenade), though Joan is careful not to characterize it as a “gospel” tune. Earle assembled a first-rate core of Music City “A-Team” players to accompany Joan, each one a headliner in his own right: respected singer-songwriters and multi-instrumentalists Tim O’Brien (who shows up on mandolin, fiddle, and bouzouki) and Darrell Scott (guitars, dobro, banjolin, bouzouki), who frequently appear on each other’s records; bassist extraordinaire Viktor Krauss; Nashville elder statesman Kenny Malone on drums and percussion; and an occasional jingle of tambourine by the album’s veteran recording engineer Ray Kennedy (Steve Earle’s long-time producer). Guest appearances are limited to two singers on Day After Tomorrow. Ray’s wife, Siobhan Kennedy, sings harmony on “Mary,” a Christian allegory written by Patty Griffin for her Flaming Red album of 1998. (The song took on a life of its own on the first Concerts for a Landmine Free World benefit album in 2001 and then on Willie Nelson’s Songs for Tsunami Relief benefit album in 2005.) U.K. singer/songwriter Thea Gilmore recorded her harmony vocal in Liverpool for “The Lower Road,” one of the songs on her May 2008 album Liejacker, her tenth album in ten years — though the song made its way to Joan months before.